Holidays are all about traditions. Unfortunately, many of the food-related traditions do no good for our waistline. Especially Thanksgiving and Christmas, a time which consists of heavy dairy, sugary drinks, baked goods, high carb meals and lots of beverages. 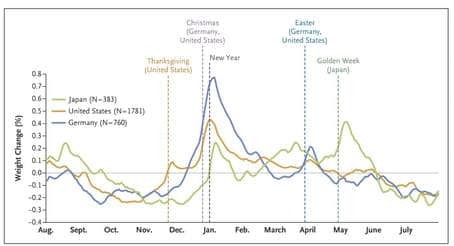 Just take a look at this chart from examine.com. The wonderful thing is… we don’t have to break the traditions! A major part of these magical moments is the time we spend with friends and family while baking and cooking and not necessarily on the items themselves. So why not keep the traditions, just alter the ingredients a little? I know what you’re thinking… ‘Chara, what if it doesn’t taste as good as the original?’ You’re right to question it and sometimes it doesn’t. It comes pretty close though and if you ask me, sacrificing a little taste is definitely worth it when looking at the long road to recovery ahead. Plus, now you can enjoy these tasty near-traditional dishes without any feeling of guilt! Need a little extra support when it comes to keeping the Holidays healthy? Click here to read more on secrets to attending holiday parties and more. Remember, the key to success and most important part is your mentality. Make the decision now that this holiday will be your healthiest, happiest holidays yet. Decide that instead of indulging in unfavorable food, you will fill those cravings by finding satisfaction within spending time with family and friends. With a little effort, you could be coming out of the Holidays a step closer to your weight loss goals versus starting the new year 3 steps behind where you left off. Make clean eating over the holidays your new traditions! 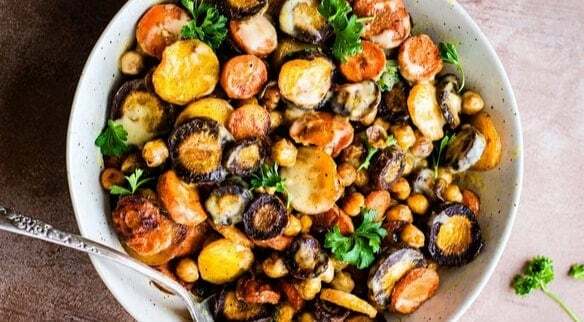 Below you will find healthier versions of some of my favorite Holiday dishes. I am a huge fan of this one! 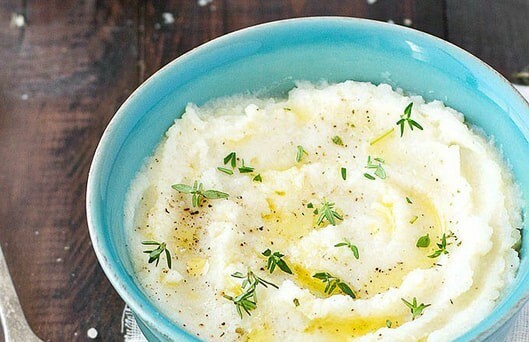 Potatoes are starchy carbohydrates that cause your blood sugar levels and insulin to rise rapidly then dip contributing to the post-dinner need for some Zzzz’s. On top of that, traditionally we add butter, sour cream, salt and other unfavorable ingredients making this dish no better off then a dessert. This recipe only calls for 6 ingredients in 4 easy steps! Since clearing gluten from my diet, I always refrained from stuffing. It was always one of my favorite holiday dishes so this year I decided to source out a healthier version. I could not believe A. How tasty it was! and B. How incredibly easy it was to make! Throw some gluten-free bread in the oven to get toasty, sauté some celery, garlic, onions, and herbs. Mix it all together with a little vegetable broth. Toss in the oven and there you have it!! I even added a few cranberries to mine! 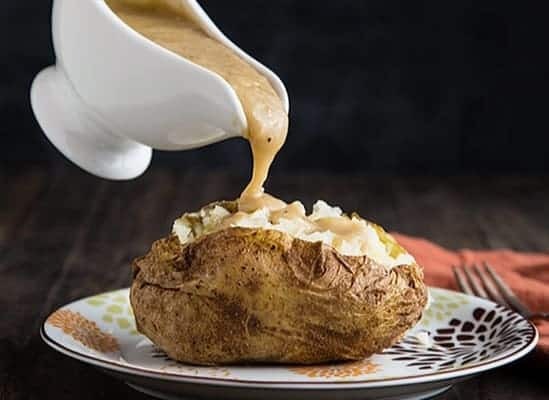 5 ingredients, 16 minutes and you have yourself a very tasty, guilt-free gravy! I always make a large batch of this gravy and take it with me when going to friends and family’s houses for Holiday dinners. This way I can have my gravy knowing it is vegan-friendly! 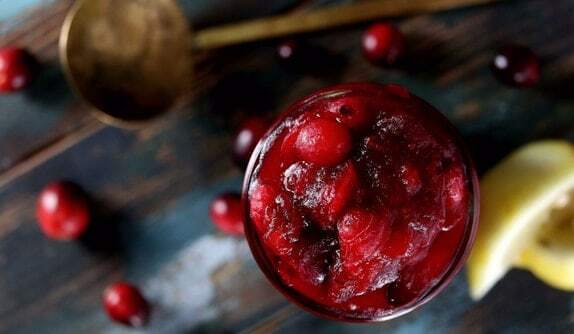 If you’re like me and thrive off the sweet and salty food combos, then you know cranberry sauce is a must! But did you know commercial cranberry sauces are filled with sugar? Thanks to healthy natural sweeteners we can have our cake (cranberry sauce) and eat it too! Even for those of you who don’t love the taste that tends to accompany brands like stevia, it’s actually quite complementing to the bitter cranberries. Different brands of natural sweeteners have different taste so try a few before giving up on them. I made this for our family Christmas dinner last year and it was a hit! Everyone ate it right up and when I told them it was vegan, they could hardly believe me! 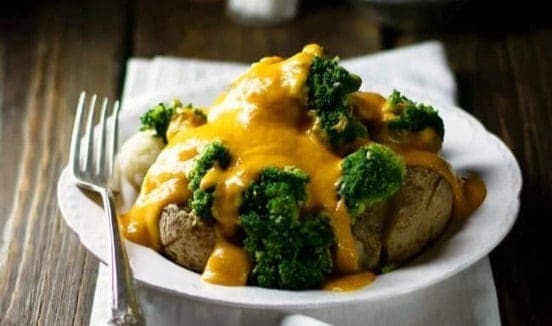 Great on top of the traditional broccoli, cauliflower and carrot dish. 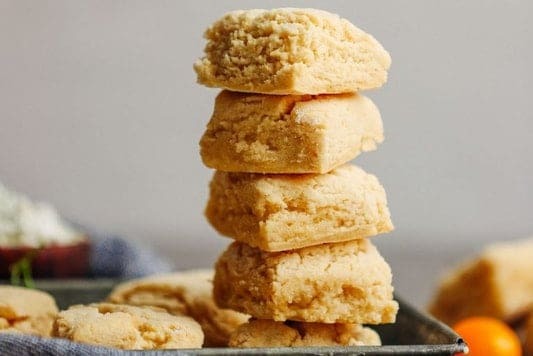 If dinner biscuits are one of your traditional dishes, you will love this healthy alternative by the Minimalist Baker! I don’t just have these fluffy buns make an appearance at Christmas dinner, these little guys come in handy with home-made soups throughout the winter too! 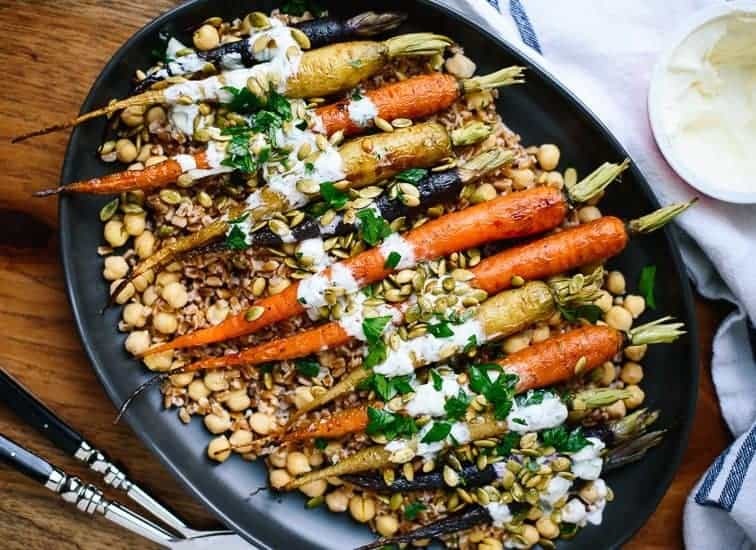 Spice up your good ol’ roasted vegetable dish with this colorful, fragrant rainbow carrot plate. The dressing is to die for! You can also add kale, spinach or arugula to turn it into a salad! Usually, during holiday dinners my plate is filled with side dishes. Don’t get me wrong, I love allll of it but sometimes it’s nice to have this option as a main. 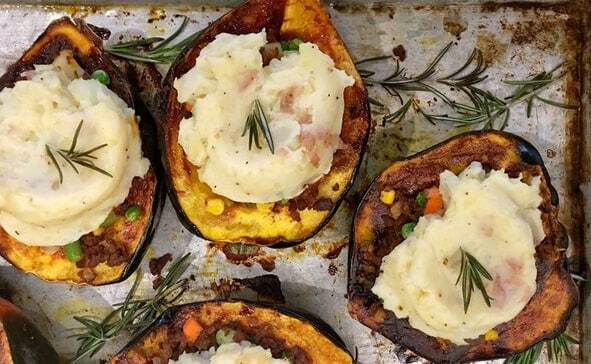 I even added a little bit of the vegan gravy on top of this tasty recipe! 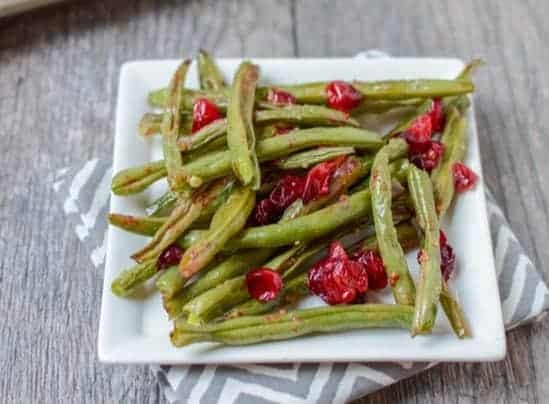 Green beans are packed with protein and nutrients but unfortunately most often served drenched in oil and with bacon. Let’s get this dish back to being healthy and delicious. With only 5 ingredients and 5-minute prep and cook time, why not include this tasty dish to your menu? Plus, the green and red colours in the recipe could not be more perfectly suited for Christmas dinner! 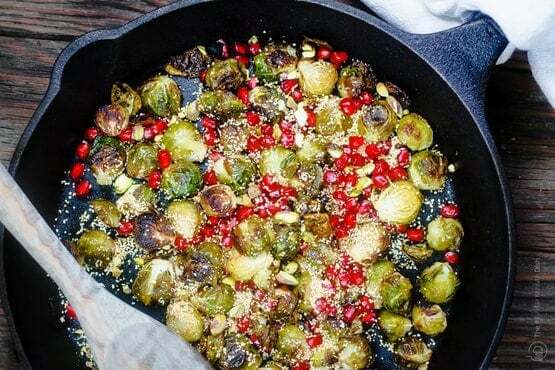 Roasted Brussel sprouts? Need I say more? The bulrger and pistachios add an excellent crunchy texture to this colorful, delicious dish.